Engineered planks in 2-1/4", 3" and 5" widths. Available in Red Oak, White Oak, and Maple. Consists of 100% sliced face top wood layer for a tighter and more lineal wood grain pattern. Micro-beveled edges and ends. Features 7-ply construction for superior milling and structural integrity. Engineered planks in 3" and 5" widths. Available in Oak and Manchurian Maple. 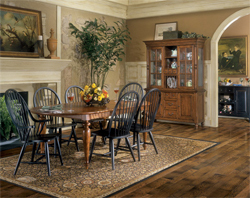 The look of authentic old-world aged and distressed planks combined with a sliced face top wood layer adds character and inspiration to any home. Micro-beveled edges and ends. Features 7-ply construction for superior milling and structural integrity. Engineered planks in extra-wide 5" widths. Available in Ash and Manchurian Maple. The look of authentic hand-scrapped rustic visuals and a stocking smooth hand sanded finish adds character to any room. Sliced face top wood layer for tighter and more lineal wood grain patterns. Micro-beveled edges and ends. Engineered planks in 1/2" thick by 5" and 6-1/2" extra-wide planks. Available in Ash and Manchurian Maple. These planks are characterized by an extraordinary multi-tonal coloration that adds rich detailing and exciting visuals. The sliced face top layer showcases the exquisite natural graining of solid hardwood versus the repetitive patterns of rotary peeled top layers normally used in engineered planks. Pillowed edges and ends. Engineered planks in extra-extra-wide 6-1/2" widths. Available in Ash and Manchurian Maple. The look of authentic handscrapped rustic visuals and a stocking smooth hand sanded finish adds character to any room. Sliced face top wood layer for tighter and more lineal wood grain patterns. Micro-beveled edges and ends. Engineered planks in extra-extra-wide 7" widths. They also feature a sawn face top layer that showcases the exquisite natural wood graining of solid hardwood versus the repetitive patterns of rotary cut wood normally used in engineered planks. The look of authentic handscrapped rustic visuals and a stocking smooth hand sanded finish adds character to any room. Hand scraped texture adds to the look of cherished and well-worn planks. Available in Ash, Oak, Maple and Hickory. Chiseled edges and ends.